This past Saturday, I joined members of our Jewish Voice for Peace chapter in Raleigh, NC at a huge rally for justice and against Trump and the Klan. Last month, the local KKK chapter announced that they would hold a rally celebrating Donald Trump’s election as President, but didn’t announce a location. Some North Carolina activists went to meet the KKK on the planned day—chasing the supposed march from Pelham, NC to Danville, VA and back to Roxboro, NC, where the Klan drove by in a measly motorcade & over 100 activists held the streets. At the same time, the Triangle Unity May Day Coalition planned a huge rally in our state capital, calling for Justice and Power to the People and rejecting the KKK and Trump agenda of white supremacy and state violence. Our JVP chapter is a member of this coalition along with local unions and worker organizations, plus groups including Muslims for Social Justice, ICE out of NC, Durham Beyond Policing, and Triangle SURJ. My name is Noah Rubin-Blose, and I am a member of Jewish Voice for Peace, Triangle Chapter. We are inspired by Jewish tradition to work for justice, freedom, and equality for Palestinians, and we are doing it because our liberation is bound up together. We are grateful to be a member of the Triangle Unity May Day Coalition, as well as the Movement to End Racism and Islamophobia. As Jews in the U.S. South, we know what white supremacist terror looks like and feels like. Our ancestors know it and we know it. If we have not personally experienced an attack, we have heard personal stories from our family members, neighbors, and members of our synagogues – from cross burnings, Nazi grafitti, and even lynchings; to everyday job discrimination. As Black people and People of Color also know, that kind of terror lives in our bones. And it’s what we do with that knowledge that matters. Do we obsess over our own victimhood, hunker down and protect only other Jews? Or do we allow it to move us into solidarity with Muslim people and Black people. In the past few decades, what we see is that white nationalists hate Jews, spout hateful rhetoric against Jews, and then target for violence and murder Black people, Brown people, and Muslim people. Antisemitism is real, and we have to recognize that it is people of Color – Jewish and non-Jewish – who are impacted, and fight it alongside racism. But we cannot allow antisemitism to be used against us. It is essential that we understand what it is and what it is not. A bill called the “Anti-Semitism Awareness Act,” was fast-tracked through the U.S. Senate last week. 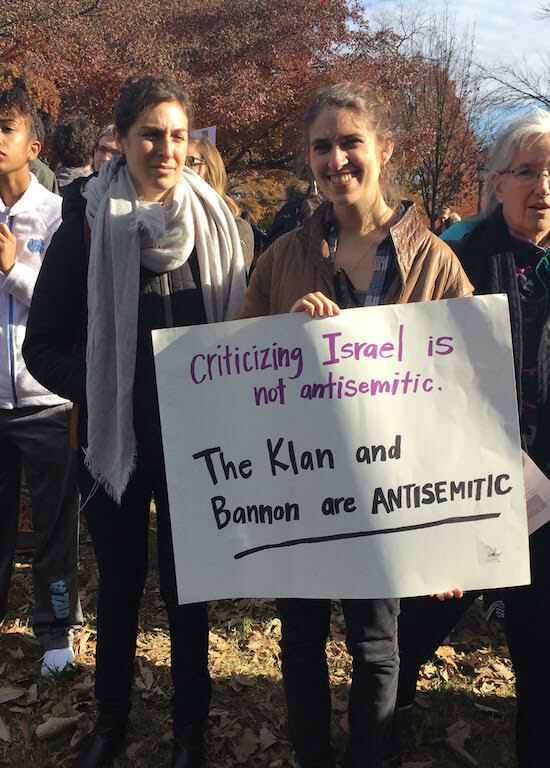 Rather than condemning Trump appointee Steve Bannon, who is extremely racist and antisemitic, this bill condemns activists who criticize racist Israeli policies against Palestinians. This bill will be used to silence dissent, and will especially be used to target activists who are Muslim and People of Color. We are entering a period where, even more than before, the state and non-governmental hate groups will work together to attack people. The FBI has a massive program of surveillance against Muslim communities, they have a massive deportation machine. The Klan and the police depend on each other to carry out their terrorism. They will try to silence any criticism as they step up the repression. So we cannot allow ourselves to be a wedge. We say #NoToBoth: No to Trump, No to Netanyahu. We say no to state-sanctioned white Supremacy, no to the Klan, and no to violence against Palestinians. There is a phrase we say often in Jewish spaces – “Never Again.” We say it about the Nazi holocaust; never again can we allow genocide against us. But what this moment calls for is that we say “Never Again” for everyone, and in so doing, to pay attention to who is most targeted. When we talk about the Nazi holocaust, when we speak about the horrific genocide against 6 million Jews, we must remember that we are not the only victims, and name that 5 million Roma people, queers, people with disabilities, communists and political dissidents were also killed. We must speak about the holocaust of Enslavement and the 500 years of genocide against Indigenous people right here. When we speak about the Shoah, the catastrophe of the Nazi holocaust, we must speak about the Nakba, the catastrophe of 1948 that displaced 700,000 Palestinians from their homes. Because, when a leader of the so-called alt-right says “Heil Trump” at a conference, they are pushing us all to forget/ignore that that means genocide. When we allow what is happening at Standing Rock, the violence of pipelines, broken treaties, and attacks on water protectors, we are forgetting/ignoring that this is ongoing genocide against Native nations. When we blame Black people for police violence, we are forgetting that there have never been reparations for slavery in this country, that it is alive and well. We cannot let people forget. And, we cannot fool ourselves into pretending we are the only ones. My fellow Jews, I am calling on you to join us, to wade through our collective fears and memories, to take action for a world that recognizes we are all b’tzelem elohim, made in the image of G-d. To speak truth about the realities of white supremacist violence; knowing that we will not be free until all Black people are free, until Palestinians are free. To bring our ancestors and our children with us, and to fight against Islamophobia like our lives depend on it – because they do.